Passover holiday proves big boom for Israeli economy, with $48.5 million in matzah and wine being shipped around the globe. Israel is exporting $48.5 million in matzah and wine to Jewish communities across the globe, the Economy and Industry Ministry revealed Wednesday, ahead of the upcoming Passover holiday. 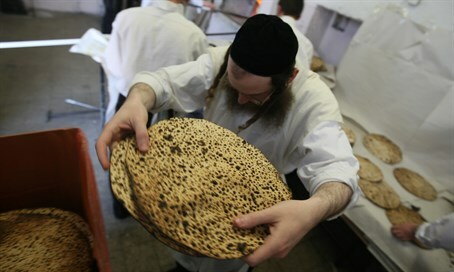 The US imports the most matzahh - $7 million worth - with European countries importing a total of $5 million. Among the European importers the UK leads, at $1.7 million, followed (somewhat surprisingly for its relatively small Jewish population) by Italy ($1 million), France ($700,000), Belgium, which imports matzah worth $600,000, and Holland at $103,000. Elsewhere, Argentina imported matzahs from Israel at $130,000, Holland bought $103,000 of the holiday staple, Brazil bought $88,000, Romania $25,000, Azerbaijan $19,000 and even Nigeria ($4,500) and the Democratic Republic of the Congo ($1,600) imported matzahs. The main types of matzah exported from Israel are special "shmura" matzahs, diet matzahs, whole wheat matzahs, organic matzahs, rye matzahs and – of course - chocolate covered matzahs. Israeli wines also have many devotees around the world: the country's wine exports in 2015 reached $36.5 million. Two-thirds of the wine was exported to the US and Canada and a quarter was sent to European countries, led by France, which imported $3 million worth of Israeli wines, and Britain ($1.7 million). Israeli wines were also exported to Germany, Belgium, Italy and other countries. Over the past three years, the Invest in Israel Division at the Israeli Ministry of Economy and Industry supported Israeli wineries with grants worth NIS 4 million. This support was intended to expand sales to markets abroad and to increase the number of people employed in the industry. According to the Industrial Department at the Israeli Ministry of Economy and Industry, 160 wineries are active in Israel, and are working at full capacity ahead of the Passover Holiday. "It is not surprising to see a rise in purchases of kosher for Passover wine and matzahs among Jewish communities abroad ahead of the holiday," Ohad Cohen, Head of the Foreign Trade Administration at the Israeli Ministry of Economy and Industry. "At the same time, we also see interest among the general public abroad, which buys kosher food because they recognize that a kosher stamp also indicates that the food is of high quality."